Which current Michigan commits took part in this week’s “The Opening”, and how did they perform? Which three targets released their top 5’s and had Michigan included? Find out in this Friday’s version of The Future Huddle. Nike's “The Opening” took place in Oregon this past week, with two Michigan commits taking part. Both Alex Malzone and Darrin Kirkland Jr. made the trip out west, while current tight end commit Chris Clark had to miss the event due to personal reasons. Alex had a pretty inconsistent week throwing the football. During some drills Alex looked very calm in the pocket and threw the ball with good velocity. On other drills, Alex struggled and had trouble accurately throwing the football. Mark Snyder from the Detroit Free Press caught up with Quarterback Guru Trent Dilfer this week to talk about Alex’s time at “The Opening”, and this is what he had to say. A big part in Alex’s inaccuracy this week could be the fact that Alex is a pitcher for his Brother Rice High School in Bloomington. As Dilfer said above, the fact that he’s played so much baseball within the past year has affected his throwing motion. Alex will surely have to make adjustments to his motions and mechanics before playing a down for Michigan, but he has ample time to do this due to where he will find himself on the depth chart when he arrives in Ann Arbor. After watching Darrin this week, I'm fully convinced that he will be a significant part of Michigan’s future. He possesses great instincts and can keep up to any offensive player across the field. If Darrin see's playing time early on in his career and, excels I wouldn't be the least bit surprised; he's that good of a prospect. 2015 DE "@DarianRoseboro: Top 6 (not in order ) 🏈 Michigan Nc state Alabama Tennessee Carolina Clemson"
This shouldn't come as a surprise that Michigan lands in Roseboro’s top 6. Michigan has been recruiting him heavily within the past year and, it leads me to believe that Roseboro could be Michigan’s next commit. With Michigan needing at least two defensive ends in the 2015 recruiting cycle, this shouldn't have any effect on the recruitment of Keisean Lucier-South. Roseboro is rated as the #6 SDE, and the #155 overall prospect according to 24/7. He had 125 tackles, 21 for a loss and 11 sacks as a junior in high school. Also releasing their top 5 this week was 2016 ATH Tyrece Speaight. Although it’s extremely early for a 2016 prospect to be releasing a Top 5, this has to boast well for Michigan. The Ohio native is currently ranked as a four star prospect by 24/7 and comes in as the #14 ATH and, #190 overall prospect in 2016. He currently has a crystal ball of 78% Ohio State and 22% Michigan. Speaight recently visited Michigan in June at the Wolverines camp. My belief right now is that he is leaning towards Notre Dame. On Thursday, 2015 linebacker Osa Masina tweeted out his top 5. MY TOP 5 NO ORDER #Ucla #Michigan #Wisconsin #USC #Arizona State Thank you to every other school. Blessed for the opportunity. I fully expect Osa’s recruitment to come down to a battle between UCLA and Michigan. Masina visited Ann Arbor last summer, and could very well show up at the Big House BBQ later this month. Getting Masina on campus would be extremely important in Michigan being able to land the Utah product. Masina is currently ranked as the #10 OLB and, #157 overall in the 2015 recruiting cycle. While at the Nike Opening, 2015 running back targets Damien Harris and, Michael Weber both announced they will be heading to Ann Arbor at the end of July for the Michigan BBQ. Speaking of the 2015 running back situation, Michigan State landed prospect Larry Scott on Thursday night. Scott choosing MSU caught me off guard a little bit, as he was considered a Ohio State lean. Since Scott is now apart of MSU's future, my best guess would be that Harris ends up in Columbus, while Weber stays in-state and becomes a Wolverine. 2015 WR A.D Miller committed to Illinois last weekend. 2015 OT Garrett Thomas committed to Texas. Michigan offered him a scholarship in March. 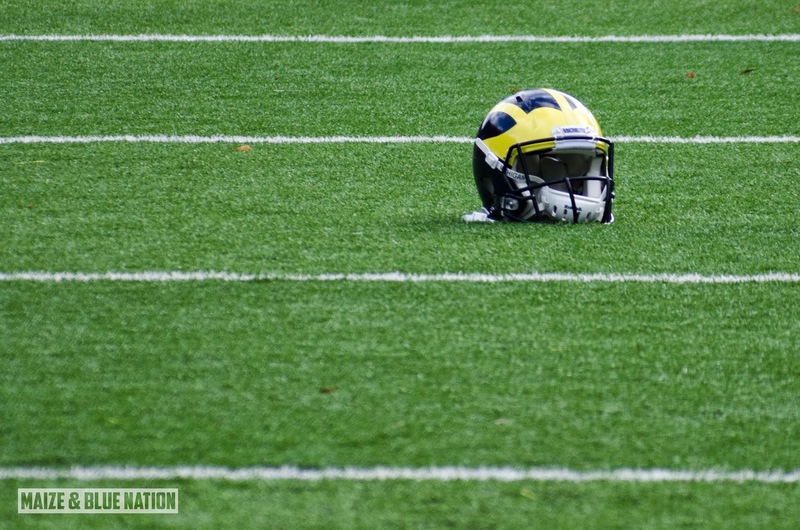 Current 2015 commit Grant Newsome will be an early enrollee when he comes to Michigan. 2016 Wide Receiver target TJ Chase announced via twitter on Thursday, that he will be transferring to IMG Academy for his senior year of high school. Current Wolverine’s Freddy Canteen and Brandon Watson both played at IMG during their high school careers. 2015 Linebacker Joshua McMillon told 24/7’s Clint Brewster that Michigan and Alabama are his leaders at this point. 2015 target Iman Marshall took to twitter on Wednesday to announce that he will not play safety at the college level, and that he is strictly a cornerback. This could prove to be a major benefit for the Wolverines as they are looking to take another cornerback in 2015, after having Shaun Crawford decommit a few months ago. Another prospect that could fill this position is current Gators commit Marcus Lewis. Lewis recently told GatorBait.net staff that Michigan will receive an official visit once the season starts. Lewis is ranked as the #9 ATH, and #152 overall in 2015. ESPN released their 2016 Junior 300 earlier this week. Michigan commit Messiah deWeaver clocks in at #115, while offensive tackle Erik Swenson ranks #256 overall. You can check out the full Junior 300 by clicking here.